A major challenge of future EU fisheries management is the integration of fisheries management with broader marine management. The focus on ecosystem based management is both a driver for regionalisation as for integration of policy to cover all sectors and activities at the scale of the marine ecosystem. The central question of this paper is: how are regionalisation and integration discourses in EU management of marine resources influencing the Integrated Maritime Policy, the Marine Strategy Framework Directive and the Common Fisheries Policy differently and which challenges arise because of these differences? We will look at the current model of governance applied and see whether this is durable in the longer term and analyse specifically the implications of integrated regional marine management. We will conclude that the process of regionalisation and integration of policy requires a further development of the marine governance system, positioning the regional level into the multi-level governance system. In recent years a number of initiatives on EU marine policy have seen the light of day, including the reform of the Common Fisheries Policy (CFP in 2002 and currently again under review; proposals are slated for adoption and entry into force by 1 January 2013), the development of the Marine Strategy Framework Directive (MSFD adopted in 2008) and the introduction of the Integrated Maritime Policy (IMP in 2007). The CFP is traditionally the platform for the conservation of (commercially exploited) fish stocks and the development of the structure and economics of fishing fleets. The MSFD is designed from an ecosystem conservation perspective (marine water quality objective) and stands in a tradition of directives already influencing the marine sphere such as the Bird and Habitat directives and the Water Framework Directive. The IMP is a policy seeking integration over a multitude of different sectoral activities and policies (i.e. shipping, oil and gas extraction, fisheries) and addressing a range of different challenges, stakes and stakeholders. In European policy-making regulations or decisions are detailed and restrictive, have a character of a ‘one size fits all’ approach, where directives, after adoption, are further shaped by the member states when they are put into national rules. In this process, and within the limits of Commission oversight, domestic actors can adopt an interpretation that somewhat deviates from the directive (van Hoof and van Tatenhove, 2009). In the current debate on EU marine policy the concept of the Ecosystem Approach has become pivotal. In essence the ecosystem approach leads us to perceive marine management in a holistic approach in which all parts of the ecosystem and all activities taking place therein need to be captured. Hence a strive for implementing policy at the geographical ecosystem level, across all activities that take place in that ecosystem. Implementation at the ecosystem level specifically challenges Member States (MS) to cooperate at the regional level and come to an integrated policy framework encompassing all sectoral policies. In the principal EU governance setup there is no such intermediate regional governing level recognised: in the EU treaty we can only find recognition of the individual Member States and the institutions of the European Union. Despite institutions such as Regional Advisory Councils (RACs, introduced under the CFP) and Regional Seas Conventions (RSCs, developed at the international level between both EU Member States and non-Member States) the regional level exerts no formal competence in EU policy, yet increasingly obtains a role in development of EU marine policy. In this article we will analyse the aspects of integration and regionalisation of EU marine policy, its implications and complications. The central question of this paper is: how are regionalisation and integration discourses in EU management of marine resources influencing the IMP, MSFD and CFP differently and which challenges arise because of these differences? In answering this question we will use a theoretical framework for the analysis of multi-level governance. This framework enables the description and analysis of the different marine policy initiatives in terms of the shifting locus of governance from the traditional state level to sub-national, regional and supranational levels. In the Understanding integrated marine policy from a multi-level governance perspective section we will further detail the multi-level governance approach and link this approach to processes of regionalisation through the concept of sphere of authority. In The EU marine policy framework section we will look in more detail into the current set of EU marine policies. In Integration and regionalisation within the EU marine policy framework section we will use the analytical framework to examine the differences and challenges arising in the integration and regionalisation of the IMP, MSFD and CFP after which we will draw conclusions in the Conclusions section. The concept of multi-level governance in the European Union has to a large extent been developed in response to dominant state-centred approaches. In these approaches European Integration is a continuous process through which European states become increasingly integrated in a political, legal and economic way. Liberal intergovernmentalists have always argued that EU Member States have controlled the process of European integration without losing control and authority over policy decisions. Consequently, the power and preferences of nation states are most important in explaining policy outcomes in the European Union (Moravcsik, 1993). In other words, liberal intergovernmentalist theorists consider national governments as the key actors in the EU system, devolving only limited authority to supranational institutions to achieve specific goals. By the principle of unanimity, they retain de facto veto power in crucial areas and, thus, individual control over outcomes. This is reminiscent of realist conceptions of international relations, focusing on the interaction between unitary state actors (van Tatenhove, 2003). National governments in this view are located in domestic political arenas, and their negotiating positions are influenced by domestic political interests (cf. Moravcsik, 1993). Intergovermentalists therefore make a clear distinction between national preference setting and interstate bargaining during EU’s decision making processes. The concept of multi-level governance, introduced and developed by Marks in the 1990s, captures the move in decision making power from the nation-state to European and sub-national actors (Marks, et al., 1996, Hooghe and Marks, 2001). In contrast to liberal intergovernmentalists, multi-level governance takes a different perspective, emphasizing shared decision making competences between European institutions, Member States and sub-national actors that is the result of treaties like the Single European Act (1986), the Maastricht Treaty (1993) and the Treaty of Amsterdam (1999) (Hooghe and Marks, 2001). The debate on multi-level governance is primarily concerned with decision-making competencies of actors on different levels. This is not to say that member states are no longer important, rather decision making in the EU is neither exclusively in the hands of member states (intergovernmental) nor in the hands of European institutions (supranational) (Jordan, 2001). Analysing decision making in the EU is much more complex and involves more than only the power and preferences of nation-states. European Integration is changing the locus of governance by integrating new actors (including non-state actors) and levels (from the sub-national to the European level) in policy making procedures at the EU level (Van Leeuwen and Van Tatenhove, 2010). The distinction between national preferences and European policy making can therefore no longer hold. In this paper, multi-level governance will be defined as ‘the sharing of policy-making competencies in a system of negotiation between nested governments at several tiers (supranational, national, regional and local) on the one hand and private actors (e.g. NGO’s, producers, consumers and citizens) on the other’ (van Tatenhove, et al., 2006, van Leeuwen, et al., 2012). The multi-level governance concept contains both vertical and horizontal dimensions. “‘Multi-level’ refers to the increased interdependence of governments operating at different territorial levels, while ‘governance’ signals the growing interdependence between governments and non-governmental actors at various territorial levels” (Bache and Flinders, 2004, p. 3). Because multi-level governance understands increased complexity in policy processes, proliferating jurisdictions, and the interplay of non-state actors and governments on different levels it is a suitable perspective from which to study the regionalization of marine management. This has become a relevant issue in European marine governance, as both the CFP and the MSFD have an increased focus on the regional level. In operationalizing multi-level governance, Hooghe and Marks (2003) developed two ideal types of multi-level governance. Type 1 refers to the more stable and general-purpose governance arrangements, while type 2 emphasizes more flexible and task-specific governance arrangements. Still, both these types of multi-level governance can have very different characteristics in terms of actors and levels involved and patterns of decision-making authority between them. To characterize regionalisation processes under the CFP and MSFD, we will use the concept of sphere of authority. This concept emphasizes authority patterns and dynamics between actors in a certain policy domain, allowing for a more detailed analysis of the role of European institutions, Member States and non-state actors at different levels in marine governance. A sphere of authority is defined as ‘the temporary stabilization of the organization and substance of a policy domain within which actors take decisions through the development of steering mechanisms and/or have the ability to generate compliance with these steering mechanisms’ (Van Leeuwen, 2010). 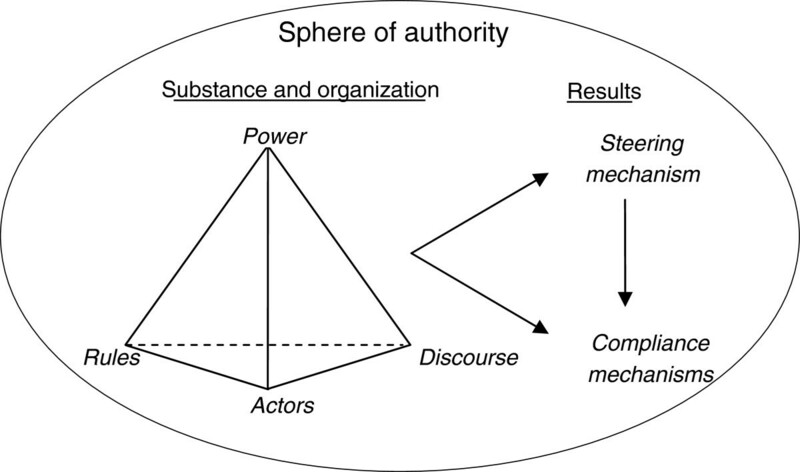 The stable organization and substance of a sphere of authority are based on the actors involved, institutions guiding actors behaviour and expectations, power resources and relations between actors and those discourses that specify the different interpretation schemes that frame actors preferences (Arts, et al., 2000). The organization and substance of a sphere of authority show the authority of actors in developing steering and compliance mechanisms. Steering mechanisms define the objectives and measures that should lead to changed behaviour and improved environmental quality. The compliance mechanisms ensure that the target group of steering mechanisms comply with the norms and regulations set. How these dimensions relate to each other is visualized in Figure 1. The interplay between the dimensions make each sphere of authority unique. Actors display authority through developing steering and compliance mechanisms. How this authority is shaped, depends on the interplay between the rules of the game, the discourses and power relations between actors. Studying this interplay allows a more detailed analysis of the regionalization processes currently occurring in the three spheres of authority around the IMP, MSFD and CFP. A sphere of authority and its dimensions. In Europe, maritime affairs have traditionally been dealt with by a number of separate sectoral policies. Such compartmentalisation of maritime governance continues to dominate at the different levels of power at international, European, national, regional and local levels (Commission of the European Communities, 2008). In 2007 the European Commission introduced the Integrated Maritime Policy. Its aim is to ensure that sea-related policies are develop in a joined-up way in order to allow the extraction of value from the sea and at the same time addressing the cumulated effect of conflicts of use and the deterioration of the marine environment (Commission of the European Communities, 2007). An integrated approach at every level is therefore a basic tool for policy-making and implementation across sectors, different levels of governance and borders, allowing systematic identification of synergies or inefficiencies (Commission of the European Communities, 2008). As a consequence the Commission states that where appropriate, and depending on the institutional powers of these levels of decision-making, it could also be useful to develop regional integrated maritime policies in line with the relevant national and EU policies (Hooghe and Marks, 2001, Commission of the European Communities, 2008). The aim of the European Union’s Marine Strategy Framework Directive (adopted in June 2008) is to protect more effectively the marine environment across Europe. It aims to achieve good environmental status of the EU’s marine waters by 2020 and to protect the resource base upon which marine-related economic and social activities depend. The MSFD constitutes the vital environmental component of the Union’s maritime policy, designed to achieve the full economic potential of oceans and seas in harmony with the marine environment. The MSFD establishes European Marine Regions on the basis of geographical and environmental criteria. Each Member State - cooperating with other Member States and non-EU countries within a marine region - is required to develop strategies for their marine waters (Commission of the European Communities, 2011b). The ecosystem approach, enshrined in the MSFD, brings with it particular challenges. Decision-making may no longer be organised exclusively along the lines of traditional sectoral policies, but needs to reflect the large, trans-frontier marine ecosystems which must be preserved in order to maintain the resource base of all maritime activities. Within this context of marine environmental protection, it is therefore necessary also to think in terms of maritime basins and the marine regions and sub-regions provided for in the Directive (Commission of the European Communities, 2008). In the European Union national fisheries management is embedded in the EU Common Fisheries Policy. Established in 1983, the CFP provides a policy framework aiming at conservation of fish stocks together with a sustainable development of the fishing industry and a supply of fish produce to the consumers. Following the reform of the CFP in 2002, fisheries management has been redefined in terms of scope (from fish stocks to the more encompassing ecosystem) and partisanship (in terms of increased participation via the creation of Regional Advisory Councils). Utilisation conflicts, negative externalities, and environmental degradation have increased, and the need for a comprehensive approach to ocean use management has become readily apparent to EU-decision makers (Commission of the European Communities, 2007). The EU Commission has exclusive competence in the realm of fisheries management (Hawkins, 2005). Hence the Commission plays a central role in setting policies, yet implementation of policies is left to the individual Member States. With the introduction of the RACs a regional component has been added to this policy process. Hence, from a fisheries management perspective, three spheres of authority are of importance. Starting point is the Common Fisheries Policy, which after the 2002 reform has an ecosystem focus and via the RACs a regional scope. The Integrated Maritime Policy is set to overarch sectoral polices and hence embraces the CFP. As the MSFD is the environmental pillar of the IMP, its ecosystem approach and regional scope are extended to the IMP. The implicit issue emerging in implementation between these different policies is one of matching ecological and administrative regions and integrating different marine activities and more specifically matching regionalisation of policy and integrating the regional perspective of the IMP, MSFD and CFP. The EU marine policy framework consists of three different spheres of authority around the IMP, the MSFD and the CFP. These three spheres of authority are differently affected by two dominant discourses of the marine policy domain: integration and regionalization. Integration is reflected in the Ecosystem Approach and its integrated management ambitions. The Ecosystem approach should address all parts and aspects of the ecosystem, while operationalizing the Ecosystem Approach necessitates to have integrated management, to include all activities and sectors and its influences on the ecosystem. Regionalization concerns the geographical aspect of the ecosystem and maritime activities, crossing boundaries. Regionalization refers to the need for Member States and governmental actors on the supra and international level to cooperate on a regional scale in order to coordinate and implement policy. In the subsequent analysis, we will explore the differences in the influence of the discourses integration and regionalisation on the three spheres of authority. After that we will turn to how regionalization in each spheres of authority is further shaped by authority differences. If we first turn to the integration discourse, different forms of integration could be distinguished: integration of activities on the one hand and integration of policies on the other. Attempts to integrate different marine activities takes place in the spheres of authority of the integrated Maritime Policy (IMP) and the Marine Strategy Framework Directive (MSFD), but not in the single sector focussed CFP. The MSFD and IMP can be seen as a two pillar system (Mee, et al., 2007) and as two contrasting frameworks for Integrated Marine Management (Sissenwine and Symes,2007). The Integrated Maritime Policy is an attempt to establish an all-embracing maritime policy (Commission of the European Communities, 2007) which will provide a coherent policy framework that will allow for the optimal development of all sea-related activities in a sustainable manner. The IMP seeks to bring together actors from a wide variety of sectors, hence also with an agenda covering a wide range of issues and inclusion of increasingly heterogeneous stakes and stakeholders (shipping, oil and gas extraction, tourism, renewable energy, fisheries, conservation) and challenges such as increasing and conflicting uses of oceans and environmental challenges such as climate change as well as posing challenges to the marine and maritime sectors to integrate the policy field (van Hoof and van Tatenhove, 2009). At the same time Member States try to coordinate and integrate conflicting activities for their territorial seas in for example integrated spatial plans. In its 2009 progress report the European Commission (EC) concludes that Member States are increasingly integrating maritime policy and increasingly share best practice in integrated maritime policy approaches. Examples are the Dutch ‘Nationaal Waterplan’, the French ‘Grenelle de la Mer’, the German ‘Entwicklungsplan Meer’, the Swedish bill on a coherent maritime policy, the Polish interdepartmental maritime policy plan and the UK Marine Bill (Commission of the European Communities, 2009). Integration under the MSFD is driven by the concept of Good Environmental Status (GES). GES is operationalised through 11 descriptors of good environmental status (Table 1). These descriptors are not sector or activity specific but focus on significant aspects of the marine ecosystem. Hence activities can be associated with a number of descriptors; for example fisheries is related to the descriptors 1: Biological diversity, 3: Population of commercial fish/shell fish 4: Elements of marine food webs and 6: Sea floor integrity. And more than one activity can have an impact on an individual descriptor. The descriptors hence group together all activities that impact on a specific part of the ecosystem. Besides the integration of activities in integrated plans, attempts are made to integrate policies. An example is the aim of integration between the frameworks of IMP, CFP and MSFD. This type of integration has to deal with the different levels of scale of its constituting policies, the different contents and the specific characteristics of the three spheres of authority. Whereas the progress report on the implementation of the IMP clearly indicates that there are developments for integration of policy it does not elaborate on the specific challenges this integration is addressing. In fact there are quite a few unanswered questions on the integration of sectoral policies and more specifically on potential conflicts between different policies. For example fish is both subject of the CFP as of the MSFD. Fisheries policy measures are the sole prerogative of the CFP. If descriptor 3: Population of commercial fish/shell fish is affected can then measures be introduced under the MSFD? This touches on the integration of the three different spheres of authority. A challenge in the integration of these policies is the different focus of the spheres of authority, i.e. the MSFD has an environmental conservationist signature, the CFP seeks to integrate conservation of fish stocks with sustainable exploitation of the resource, and the main stay of the IMP is the search for integration of economic wealth and social wellbeing in a sustainable way. In EU marine management, the integration discourse has given impetus to the emergence of a second discourse, i.e. that of regionalization. The IMP and MSFD formulate the regional level as the level at which both activities and policies should be integrated. In its progress report on the IMP the EC stresses the importance of regionalization. According to the report the implementation of the MSFD and the development of sea-basin strategies play an important role. The sea-basin strategies allow for the priorities and the tools of the policy to be adapted to the specific geographic, economic and political contexts of each large maritime region. Co-operation with and among Member States and regions sharing a sea basin is a crucial element of success and, whenever necessary, this should be accompanied with proper dialogue with third countries sharing a sea basin with the EU (Commission of the European Communities, 2009). In other words, it is at the regional level that the ecosystem approach should be translated towards local specifics, and integration between activities and policies can be advanced while taking the regional ecological, socio-economic and political characteristics into account. However, this discourse has a different effect and different meaning under the different spheres of authority of the IMP, the MSFD and CFP. With the introduction of the MSFD for the first time in marine law the level of the marine (sub) region is introduced. On that level good environmental status has to be realized. Regionalization in the MSFD spheres of authority is based on two considerations. The first is the regional sea basin principle, hence dividing Europe’s marine waters into four geographical areas.a The second consideration is the need for Member States to cooperate in implementing the MSFD as waters stretch along several Member States. The discourse on regionalisation in the spheres of authority of the MSFD is closely related to the existing Regional Sea Conventions and their historical role and their ability to integrate the EU Member States at a regional sea level.b Hence the MSFD attempts to bring together a physical regional boundary of the ecosystem with the several political administrative boundaries of Member States and non-EU states. Regionalization of the CFP spheres of authority was first introduced in the 2002 reform by establishing Regional Advisory Councils. The seven RACs are stakeholder fora consisting predominantly of representatives of the fisheries sector (Hegland et al., this issue; Council of the European Communities, 2004). The RACs are primarily meant to function as advisory bodies towards the Commission but also the member states can draw on the RACs for resolutions. The RACs are predominately organised along specific sea areas (corresponding to large marine ecosystems/regional seas) yet two are based on a specific type of fisheries (Council of the European Communities, 2004). In contrast to the MSFD, the regionalisation under the CFP is much more framed as addressing the complex physical and political geographies of the European seas making a provision for the transfer of responsibility for much of the detailed management to the regions (Symes, this issue). Hence it links the fisheries constituency (fishermen, processors, traders, Environmental NGOs) to fisheries management on a regional level, yet it neglects a particular aspect of the ecosystem approach, i.e. the integration with other sectors, activities and policies. The differences in how regionalization is affecting the spheres of authority of IMP, MSFD and CFP are not only influenced by how regionalization is framed and formulated as a discourse, but also by the other dimensions of the spheres of authority, especially the rules of the game and the power relations. Although in its basic form both CFP and MSFD are rather top down hierarchical policies, there is a significant difference in authority patterns between EU institutions and Member States. These differences in authority patterns are mostly related to differences in rules of the game and power resources that shape the authority of different actors over the regionalisation process. Under the CFP the EC has exclusive competence for the management of fisheries; the Member States are bound by this supranational policy. These rules of the game put much of the decision making authority in the hands of the EU institutions. As the MSFD is a directive, policy development does not end at the last stage of the legislative process in the Council of Ministers. After adoption, directives are further shaped by the member states when they are put into national rules. In this process, and within the limits of Commission oversight, domestic actors can adopt an interpretation that somewhat deviates from the directive. In this way, EU policy-making is best described as a long chain of mutually dependent decisions that cuts across multiple levels of government (Steunenberg, 2006). This is even more relevant for the MSFD, as it is a framework directive (van Leeuwen, et al., 2012). The MSFD sets a framework of steps that Member States have to follow in order to define national steering mechanisms which include the national targets for good environmental status and national programmes of measures. Compared to other environmental directives, the formal and informal rules of the game of this spheres of authority give Member States therefore more freedom in shaping the implementation of the MSFD. In terms of authority the regionalisation of fisheries policy through RACs can be perceived as a step towards delegationc. Yet, the rules of the game allow the EC to remain in a very strong position in devising fisheries policy because of its exclusive competence. The RACs have limited direct authority over steering measures under CFP, yet can have some influence on the decision making process. Following Arnstein’s (1969) classification of participation the role of the RACs in the policy process can be characterised as informing, consultation and placation yet far from actual devolution of powers. Their authority in decision making depends on the power they are able to successfully display in their informing and consulting role. The introduction of RACs did to a certain extent change the rules of the game of the CFP, because it opened up fisheries policy making to other stakeholders, especially environmental NGOs (eNGOs). It influenced the power resources available to stakeholders and with that also the authority patterns displayed within the spheres of authority. In fact with the introduction of the RACs, the authority of fishermen declined as the possibilities of eNGOs to formally influence policy increased. Also the sectoral fisheries discourse had to give way to a more conservationist discourse based on the ecosystem approach. Yet regionalisation under the CFP does not follow an ecosystem approach per se, but rather tries to find a match between an administrative constituency in policy development and implementation, and the geographical dimension of an ecosystem. In the regionalization of the MSFD, the Regional Sea Conventions play a crucial role. Similar to the RACs under the CFP, RSCs are added as a forum through which policy making and implementation is influenced. However, the process of connecting the RSCs to the MSFD has been characterized by both decentralisation and devolution. Decentralisation as the Regional Sea Conventions obtain a formal position in the implementation of the MSFD (Commission of the European Communities, 2006) and devolution as Member States have the authority to shape the formal position of the Regional Sea Conventions and to implement the MSFD at the national level. At the moment, there are only limited rules of the game that guide Member States in shaping the role of the RSCs or the national implementation. As a consequence there are differences in scope and pace in implementing MSFD between the Member States and the regional seas. The role of the Member States in the Regional Sea Conventions differs for example based on the power of the Member States in the RSCs and on the specific dynamics of the RSCs in operationalizing the Ecosystem Approach (van Leeuwen, et al., 2012). Two main factors are contributing to these differences: 1) the divergence between the definition of environmental quality by the Regional Sea Conventions and the aim of achieving Good Environmental Status by the MSFD; and 2) the extent to which the RSCs is able to develop new rules of the game to function as a coordinating body to implement the EU’s policy. In this respect we see that in the North Sea and the Baltic the MSFD is rather minutely implemented by RSCs whereas for the Member States bordering the Mediterranean and Black Sea there is less support from the RSCs. For the Barcelona and Bucharest Conventions (the Regional Sea Conventions of the Mediterranean and Black Sea respectively) this is much more challenging given the majority of parties being non-EU Member States, the lack of scientific data on the status of the marine environment and the lack of capacity to implement the MSFD as speedily as required. Although these Conventions are in the process of adopting an Ecosystem Approach, they do not embrace the MSFD as their counterparts in the North Sea and Baltic Sea have done. Whereas the authority of EU institutions is large in the CFP, the EU institutions have a much weaker position in the MSFD because of the emphasis on regional and national implementation. The authority that EU institutions, especially the EC, do have in the regionalisation process of the MSFD depends on the Common Implementation Strategy. The Common Implementation Strategy provides a set of rules of the game that shape how national delegations of Member States, the EC and stakeholders (such as scientists, industry and eNGOs) are involved in ensuring coordination of the implementation of the MSFD at the EU level. Ways through which coordination at the EU level has been provided are: the decision on criteria and methodological standards on GES of marine waters, which was adopted in September 2010; information exchange between the Member States on issues such as the initial assessment and latest scientific information on marine litter and the GES descriptors; and by discussing the synergies and linkages with the IMP, CFP, Water Framework Directive, and Natura2000 (van Leeuwen, et al., 2012). Differences in the process of regionalisation between the IMP, CFP and the MSFD are related to differences in the dynamic between the discourses of integration and regionalisation on the one hand and the authority patterns within each sphere of authority on the other hand. What becomes clear is that there is no one single approach both under the IMP, CFP and the MSFD for integration and regionalisation of marine policy. Natura2000, Birds and Habitat Directives, Water Directive, MSFD and CFP all have an angle on marine conservation. Especially the IMP and MSFD have an inclusive perspective cutting across sectors and activities. Yet on a policy level it remains unclear how these different sets of policies are being integrated. This would require building bridges between spheres of authority or the development of one integrated sphere of authority. As the analysis shows, differences in how regionalisation is perceived and shaped by the IMP, CFP and MSFD are paramount. Moreover, differences in rules of the game, power relations and authority patterns complicate integration even further. Moreover, there seems to be a lack of integration over activities, as for example renewable energy/windmills, shipping and oil and gas extraction, seem to be left out of the equation. Some sectors are not easily captured at the regional level and in addition may have a separate policy framework. The fisheries sector is illustrative for a sector that can be captured at the regional policy level yet operates under a specific framework: the CFP. This is even more emphasised when looking at for example international shipping. Shipping cannot be captured at the regional level because in the spheres of authority of the International Maritime Organization Member States and EC develop steering mechanisms at the international level (van Leeuwen, 2010). Hence both in trying to integrate policies and operationalise policy at the regional level there is the requirement to bring together the different levels of policy making, ranging from the local, national regional, EC and international. Integrating spheres of authority over these different levels within an EU context still falls short of addressing international obligations of Member Stats. As seen by the operationalisation of the MSFD in the Regional Sea Conventions, both the role of the RSCs in the regional sea as the role of Member States within the RSCs widely differs between regions. Hence the challenge to regionalise and integrate spheres of authority over different levels of policy making, different policies and different sectors. What becomes evident is that in the process of implementing these new policies of MSFD and IMP the rules of the game are unclear; new policies and new discourses bring about new rules, yet existing discourses and rules need to be taken into account. This mix between existing and new elements results in unique dynamics in authority and policy making in each spheres of authority. Currently there is no steering mechanism available that guides integration and regionalisation of the different spheres of authority. The implementation of EU environmental directives, such as the Bird and Habitat directive, Natura2000 and the Water and Marine directives show an institutional void; there is no equivalent regional governance level between the EU level and the Member States (van Hoof, 2010). Although in EU marine management the regional level seems to be the most appropriate level at which to organise marine policy development and implementation, this is not foreseen in the EU treaty. In order to facilitate this regional level, the multi-level triplet Member State, regional seas, EU needs to be redefined in terms of partisanship and competence. In this multi-level governance discourse still the rules, power resources and actors involved need to be redefined. In addition, it is worthwhile to note that fisheries policy and the quality of marine waters in general are policies that both within the EC and in the majority of Member States are championed by different parts of government, with the CFP in the realm of DGMARE and the Ministries responsible for Fisheries, while the MSFD falls under the auspices of the Environmental DG and Ministries. This latter is also reflected by the constituencies of the policies, with roughly speaking fishermen on the one side and conservationists embracing the MSFD on the other side. This separation in discourses and actors that use the discourses becomes eminent when it comes to the actual management of fish stocks. Fisheries management is the prerogative of the CFP, yet as part of the ecosystem fish is also an indicator for good environmental status under the MSFD. This difference in discourse might hamper the integration between the CFP and MSFD. While the oil and gas sector, navigation, and eNGOs have been actively involved in the MSFD consultation process, the fishing sector’s engagement has been limited (Ounanian, et al., 2012). In fact, by their involvement in the RACs and in the operationalisation of the MSFD the eNGOs are increasing their influence. Basing the EU’s marine and maritime policy on the Ecosystem Approach has clearly some policy design implications. Policy development should be region (ecosystem) orientated and should be integrated over all sectors and activities. The example of the EU constellation of the CFP, MSFD and IMP illustrates that an integration of policy over sectors and activities provides certain challenges. In fact in the current process of regionalising marine policy we note two distinct trajectories; one under the CFP and one under the MSFD. Both trajectories are founded on the realisation that policy needs to be based on the specifics of geographical ecosystem boundaries and political and practical administrative units. Hence moving away from a top down, one-size-fits-all style of policy development. Yet the CFP is still a policy with exclusive competence for the EC; rules are set in detail at the supranational level, implementation is left to the Member States. The MSFD is a framework directive, at the supranational level defining a general objective yet leaving detailing and implementation to the individual Member States. Under the CFP regionalisation is sought through the establishment of RACs; introducing a sector based regional form of participation in the policy process. Under the MSFD regionalisation is sought through the Regional Sea Conventions. Under the CFP regional cooperation between Member States is not foreseen, whereas under the MSFD regional participation of sectors is not foreseen. Currently in operationalising the MSFD it appears that on a regional scale in some of the Regional Sea Conventions a collective process of defining basic principles of operationalising good environmental states and developing an action plan is underway. Yet translating the general principles into a plan of action remains a Member States affair. Regional cooperation at this stage appears to be: let’s first define our own action plan and then talk to the neighbours how to cooperate. If we add to this the fact that under for example the Habitat part of Natura2000 and the river basin approach of the Water Framework directive also aspects of regional cooperation are introduced into the realm of marine policy, the main question that remains to be answered is how to define a (geographical, ecosystem, political, administrative, policy) region and how to define cooperation and integration. In its proposals for the 2012 CFP reform, the EC suggests that regionalisation is continued all the way down, and would include more self-management for the fishing industry by increasing fishermen’s involvement in the policies and extend the role of the Advisory Councils in advising on conservation policy under the regionalisation model (Commission of the European Communities, 2011a). Similarly, Advisory Councils could extend their activities to other areas of marine management that affect fishing activities. Hence the current role of the RACs in advising in fisheries policy is maintained and slightly extended to other areas of marine management as long as they affect fisheries. Yet further integration over other policy domains and other sectors is not detailed. The progress report on the MSFD relates that several Member States are increasingly integrating maritime policy by developing water or sea plans. The Member States bring under one umbrella different policy domains relating to the marine ecosystem. Yet the issue of indeed integrating policies of different frameworks (CFP, MSFD) different scale (CFP and IMO) and different sectors remains to be done. Let alone including in a marine policy framework the effect of land based activities on the quality of the marine ecosystem: from the perspective of the MSFD and good environmental states will it be enabled in the coming years to develop policies within the context of GES that will supersede the CFP and the Common Agricultural Policy? Or do measures for the management of the marine environment need to be included in separate sectoral polices? Related to this are the differences in discourse, authority and rules of the game, not only between the policy domains (CFP vs. MSFD), but also between countries, the EC, RACs and RSCs. Concerning the role and position of the EU in the management of marine resources regarding developments of increased regionalisation and integration of policy the conclusion must be that although steps have been made under the separate marine policy domains there is not a convergence in the way regionalisation and integration are perceived. What is clear is that this process requires a development of the setup of the marine governance system and positioning of the regional level into the multi-level governance system. From the fisheries discourse impetus is given to a further development of the RACs (Hegland et al, this issue). Focused on aspects of participation it can be envisaged that the RACs are extended to cater for representatives of other marine sectors and stakes. From the environmental discourse impetus is given to the regional cooperation between Member States through the Regional Sea Conventions. Noting that in the EU treaty the regional level is not acknowledged, the apparent need for regional cooperation, both in terms of coordination between Member States’ policies and stakeholders’ participation, and the need for considering economic and ecological aspects of the social-ecological system and the use of its resources it would be a step forward to seek a merger between the RACs and RSCs. aBaltic, North Sea, Mediterranean and Black Sea. bOSPAR, HELCOM, The Bucharest Convention and the Black Sea Secretariat and the Barcelona Convention. cThe transfer of tasks and authority of central government to other institutions can take different forms among which devolution: a permanent, irrevocable and formal transfer of powers to an institution; decentralisation: transfer of power from a central authority to lower-level agencies; delegation and de-concentration: superficial changes that do not substantially affect decision-making (van Hoof et al. 2006). The empirical data for this article have been generated by studies implemented under the EU FP7 projects Options for Delivering Ecosystem Based Marine Management (ODEMM) and Making the Ecosystem Fisheries Ecosystem Plan Operational (MEFEPO). We thank all participants for sharing their time and knowledge with us. The article is based on joint work of the authors. L. van Hoof drafted the manuscript with contributions of the co-authors. All authors read and approved the final manuscript.